An artist’s impression of Sacrewell Mill has been added to a range of souvenirs in the gift shop. 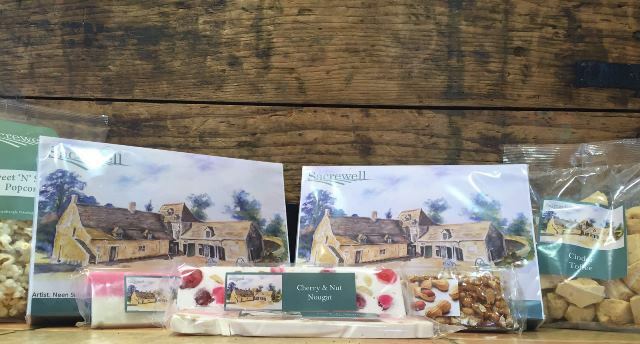 Sacrewell’s new confectionery features an image of the mill drawn by local artist Neen Sidnell. The souvenirs and treats include luxury fudge, popcorn, cinder toffee, coconut ice and nougat. Retail manager Clive Giddings worked with confectioner Farrah’s on the line of products. He said: “Sacrewell Mill is a local icon and we’re delighted to be able to add Neen’s beautiful picture to the range of souvenirs in our shop. The shop itself has also had a coat of paint recently and will be refitted later in the spring, so watch this space. Sacrewell gift shop is open from 9.30am – 5pm every day and there is no admission fee. Parking is free.